When I wrote chicken stroganoff post this idea of “Around the World…” got stuck in my head. I thought hmmm how many recipes from around the world can I write in 80 posts? It is absolutely not a task I have assigned myself nor a challenge ( raising five kids is enough of a challenge ), just an idea as I love trying out new things. Few years back during summer break we did a whole activity where my sons did a little presentation on Turkey, Morocco, Spain, Greece, France and Italy ( my memory allows me to recall only a few!) and my daughter drew and painted a picture from each country. What did I do? Cook of course! It was fun. Looking back at posts there is apple pie ala mode from US, Oh So British old fashioned chicken and vegetable stew, Greek chicken gyro with tzatziki sauce etc.. I’ll count later. Let me start fresh with the spirit of love thy neighbor, Afghanistan with Afghani or Kabuli Pulao/Pilaf/Pilav/Rice. Their food preferences are pretty similar to Pakistani tribal areas. Food is simple, non spicy with minimum preparation and ingredients. In a pot heat oil and saute onion, 30-40 seconds, and add cumin, cardamom, cloves, black peppercorns and cinnamon stick and fry for few seconds. Keep stirring, don’t let it burn. Pour in the stock, cover and let it cook on medium flame for around 5-7 minutes till stock is reduced to roughly 1/2 cup. Add rice, mix well, cover and let it simmer for 4-5 minutes. Switch the flame off but do not open the lid for few minutes. In a small frying pan heat oil and fry carrot slices till softened a little. Add raisins and powdered sugar. 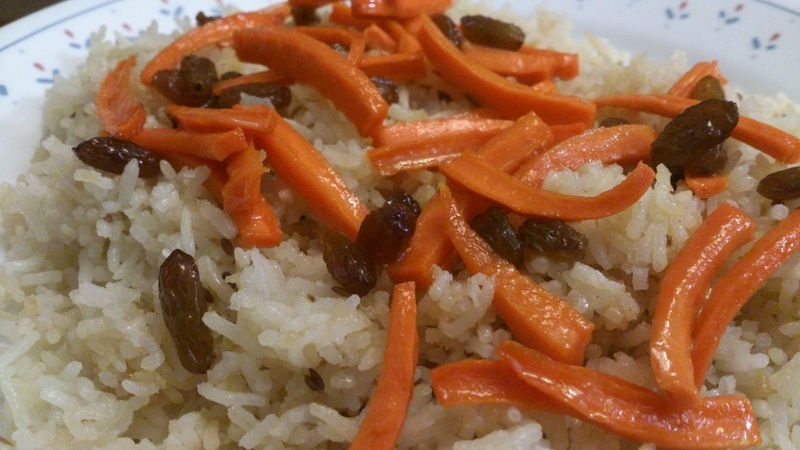 Keep stirring till sugar is dissolved and carrots and raisins appear glossy. You can mix this with rice or spread rice on a platter and top with this mixture. Serve hot with butter chicken or chicken in cashew sauce or wait a while… I have another fabulous chicken recipe to share! Using stock will give color, aroma and extra flavor to the dish. Most stocks have salt added therefore I have not mentioned salt. I use KnN chicken cubes, 2 packets = 4 cubes. Reducing the stock will bring out more flavor from other spices. Basmati or Sella rice is preferred. I used leftover plain boiled rice which were fully cooked. I mentioned powdered sugar and NOT icing sugar. Sugar that we have locally has big granules which will take longer to get dissolved and carrots might burn during this time. Amazing idea! Eager to see what’s next on your platter 🙂 Best of luck! Thanks Bec. I tried your wings recipe today and absolutely loved it. Yeah but then you don’t need additional seasonings. We’ll be having Eid next Friday and I’m thinking about adding these wings to my Eid menu. Thank you so much Anita. If you have any suggestion or ideas I would be glad to hear. all i can read is “FOOD” and lots of it… ! !